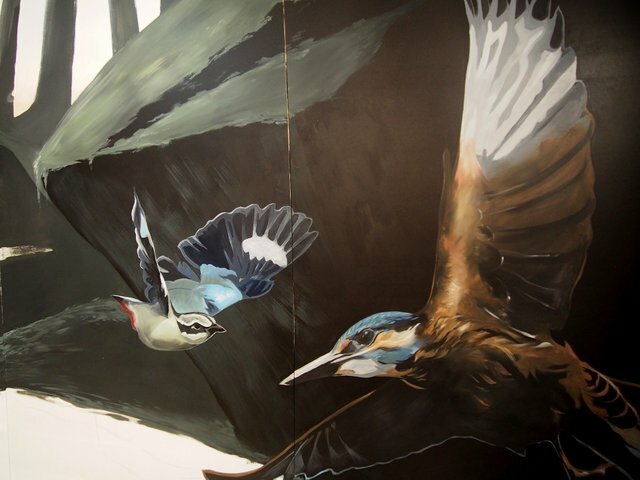 A short walk through of the process of designing, painting and installing this mural that I had been working on over the past couple months. 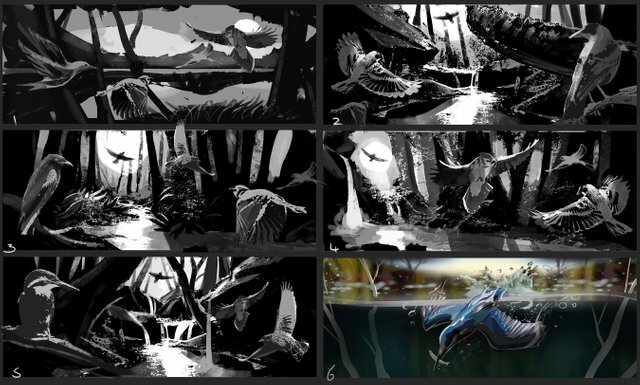 As with most projects I began with some rough concept sketches. We ended up running with #2 but with some minor changes. Early beginnings. The MDF panels had all been sanded and a coat of sealer applied to each panel. Each panel measured 2.4 x 1.2 metres, It was impossible for me to work at any larger size inside the shed. The 4 panels span the entire side wall with one extra panel out of view. Most of the outlines had already been established, after that it was a matter of mixing litres of paint and blending everything in. 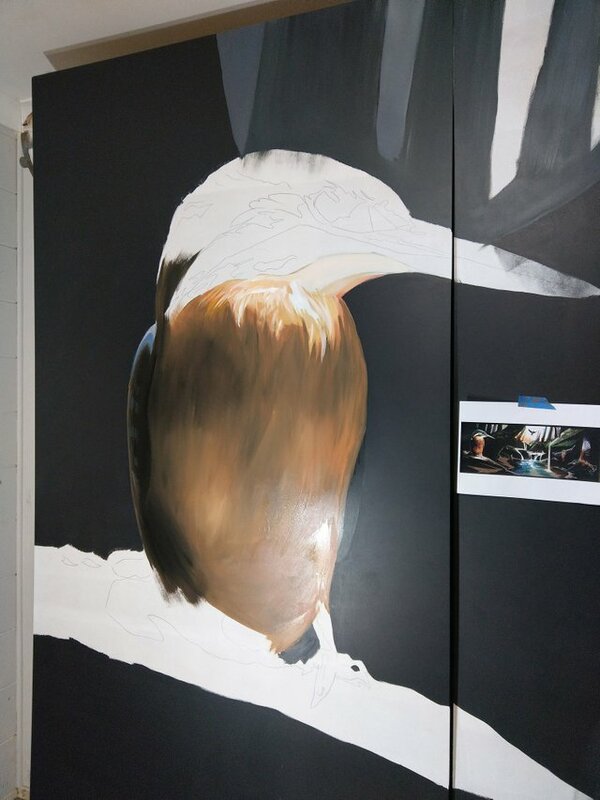 Kingfisher is getting some paint, It was tricky trying to blend such large areas, I had to work quick before the paint began to dry. Getting ready to varnish the artwork. I love it! This is really quite lovely! You captured the aspect and lighting beautifully. And everything seemed to come out well in the end. I know a little about what you mean with blending paints and working quickly. 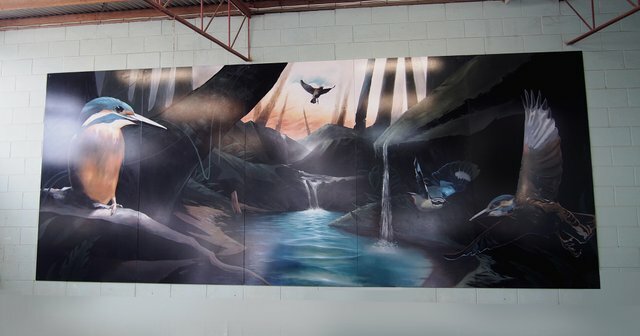 I did a college gym mural while I was a student there. It was cartooned characters of the lion mascot working out. It was tough to make it look great from 15 feet away and 3 feet away. I know my work wasn't near as good as this one here. Good job. And thanks for sharing it with us! Nice! Kudos on the Gym mural, that would have been tricky, are you still painting? 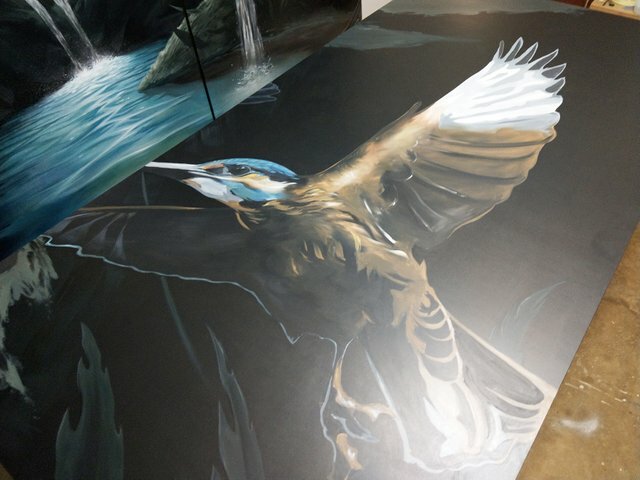 I would have liked to have been able to step back from the painting and see it at a distance, but my work space was quite limited. Thanks for the kind words. No, I havent painted in a while. Hope you share lots more with us! 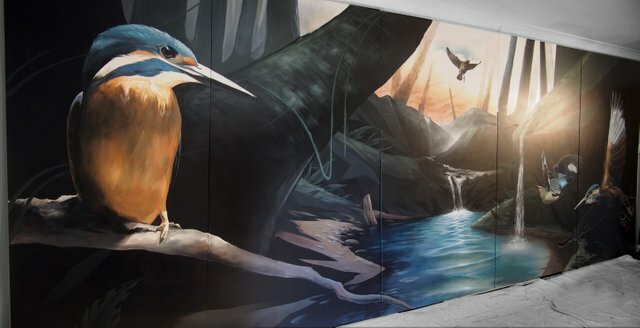 Awesome mural, Jeremy! What a stunning piece! 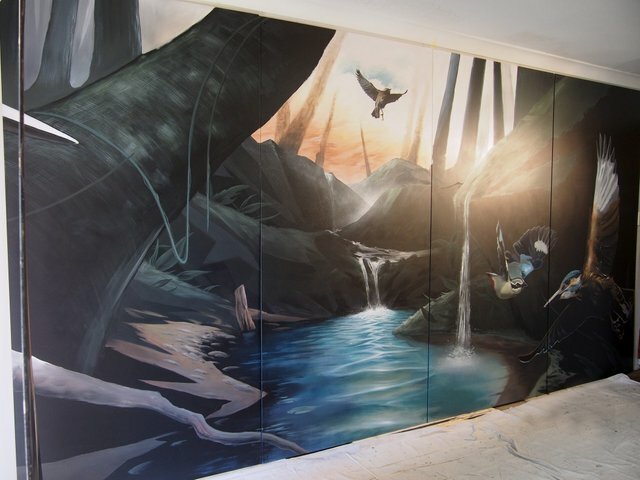 Wow amazing mural, Jeremy! I bet it would look even better in real. You draw birds so well, especially their feathery wings <3. Thank you :^), it was hard to get a good photo of. Wow! Brilliant work! I very like details! Wow! The lighting and colors in this piece are stunningly gorgeous! 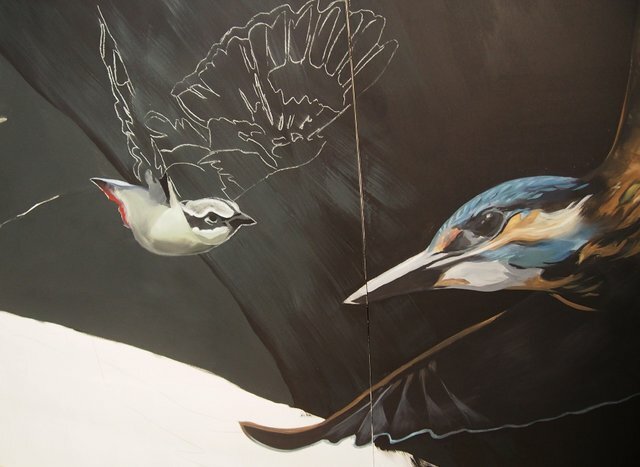 And the details on the bird, my jaw just droppe, how much time took you to finish this work is huge! Thank you very much, It took about 160 hours over the span of a few months. Including concept design, sanding, priming, painting and installing. Thank you Martina! It was a long time coming but I think they are quite happy with it! OMG. 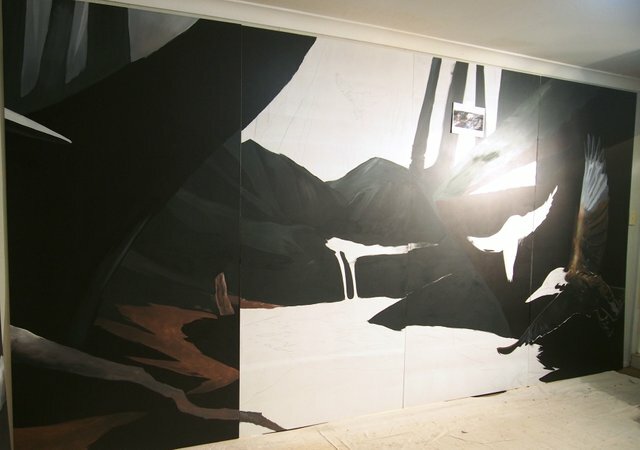 It is the first time I see the process of a mural. Awesome: or it's spectacular. The design is beautiful. the water seems real wow ... I love it. How much did it take to finish it? Thank you! it took about 160 hours over the span of a few months. including concept design, sanding, priming, painting and installing. It is yours? It was so beautiful, I wished I can make the mural like this.. The mural is beautiful @jeremyrfk! The birds look very much alive! And it is a really big mural, isn't it? I love the colours of the birds and the shine you added to the stream of water. They look so pretty together. Thank you for sharing this with us. How did you decide on this scenery? Thank you for the kind words! The scenery was a natural conclusion given that I wanted to create something tranquil and calming. Aaah it definitely is tranquil and calming :) You have a beautiful mind. I really love the water... Have you been to a forest like this? I have visited quite a few rain forests and waterfalls similar to this, I love hiking and would love to do it more often, thank you! Aahh it shows in your mural :) I hope you get to do more and find more inspiration for more murals :) Happy Sunday there @jeremyrfk! So STUNNING! I am amazed at the scale of the work. Its common to come across works on 8 x 11 paper, but this takes a special eye and skill. Please keep sharing! ¡Hola @jeremyrfk! 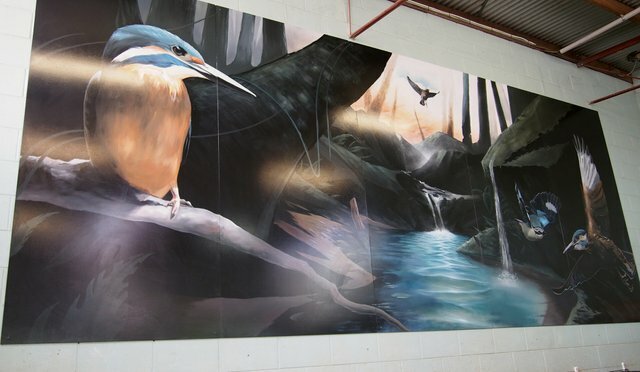 Me gustó mucho este mural el tema, la iluminación y los colores, trasmiten una sensación maravillosa de relax, solo tienes que imaginar el canto de las aves y el sonido del agua, para sentirte completamente relajado, es simplemente un mural precioso, ¿cuál es tu trabajo? ¿Haces este tipo de trabajo en tus tiempos? Gracias por compartir esta hermosa obra de arte, te felicito por tu voto Curie, cuéntame ¿Cómo te sentiste? Gracias por las amables palabras de @celinavisaez. No hago este tipo de murales muy a menudo, especialmente uno de este tamaño. Me complace que haya disfrutado de mi trabajo. Estoy muy satisfecho con la votación de Curie. Gracias por su comentario.